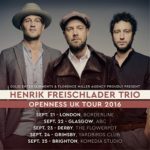 You could hear huge sighs of relief in guitar shops all over Britain earlier this year when Henrik Freischlader announced his return to playing and recording music. His playing’s very accessible to all, but guitarists just can’t get enough of him. Whatever the reasons for his extended sabbatical he’s come back firing on all cylinders with a great new album “Openness” and he’s now coming back to the UK to play some dates as the Henrik Freischlader Trio with Alex Grube (bass) and Carl-Michael Grabinger (drums) working in the engine room. His playing alone will have the guitarists in the audience salivating, but he has another secret weapon; he has a very, very good blues/soul voice. This isn’t just a guitarist who sings a bit, this is someone who’s a guitarist and a singer and he’s completely at home in both areas. Special guests are still being confirmed but the Henrik Freischlader Trio will be joined by Stuart James Band for the London gig and Ben Poole will play in Brighton.